Instructors and students stress the importance of empathy in the classroom, even as researchers debate how—and whether—this trait can be learned. Ask Haley Jo Hyde, 19, what makes her empathetic, and she'll mention her childhood on Wisconsin's Red Cliff Indian Reservation or her struggles leaving an abusive relationship. Talk to Nick Thompson, 37, and he'll refer to the challenges he overcame to enroll in college as a nontraditional student. Both aspiring social workers, now undergraduates at the University of Wisconsin-Superior, cite personal experiences—not their time in the classroom—for sparking their ability to "step into another person's shoes." Yet Hyde and Thompson also credit professors for helping them build upon their existing empathy, whether teaching them how to transform client relationships into plans of action or expanding the types of people with whom they can relate. Thompson, for example, says that learning about different cultures has helped him better understand where clients are coming from when they talk about a problem. In addition, fulfilling a course requirement at a local homeless shelter let him test out newly taught skills like active listening. "I've found school helpful from an empathy standpoint because it allows me to practice what I'm learning," Thompson says. "My empathy is like a tool, and I'm getting better at using it." The question of whether social work students can learn empathy is one of great debate and few definitive answers. Neuroscientists believe they have discovered the type of brain cells responsible for empathy, but it's still unclear how much adults can alter their initial neural imprints. Some professors seek to understand reasons for varying student empathy, often with inconclusive results. Others set out to build empathy indirectly by teaching related skills like self-awareness and reflection. Even without a final verdict, educators say there is a professional imperative to teach and model empathy in the classroom—and social work students appear to agree. Say the word "empathy" around social workers and most will recognize it as a professional "must-have," even if they can't tell you exactly what it means. Scholars also disagree about the definition of empathy and what it looks like in social work practice. According to some, empathy occurs when a person takes on the feelings of another—the sadness of losing a loved one or the joy of landing a job—as if sharing that experience. Indeed, the Social Work Dictionary defines empathy as "the act of perceiving, understanding, experiencing, and responding to the emotional state and ideas of another person" (Barker, 2003). Others separate empathy into its cognitive and affective forms, that is, a rational understanding of a person's situation vs. a feeling of shared emotions. According to V. Suthakaran, PhD, an assistant professor of psychology at the University of Wisconsin-La Crosse, this dichotomy mirrors the one found in cognitive experiential self theory. That theory claims that humans rely on two systems to process information: one tapping into logical thought and one relying on personal experience or intuition (Epstein, 1994). Still others say that empathy requires shedding one's own beliefs and experiences to imagine how someone else feels based on their specific worldview. Two people going through a divorce may have different experiences, for example, based on factors like their religious beliefs or the reason for the breakup. "You don't want to assume you know how a client is feeling because you've gone through the same event," says Hope Bell, PhD, an assistant professor of counseling at The University of Texas at San Antonio. Instead, Bell advises budding social workers to gather information about each client's history and mindset to consider experiences from their point of view. Varying definitions aside, how can social work professionals decide whether or not students can actually learn empathy? That's the question behind research spearheaded by Kristen Zaleski, PhD, LCSW, a clinical assistant professor at the University of Southern California School of Social Work. According to Zaleski, she and her colleagues recruited 306 graduate social work students to complete the Questionnaire of Cognitive and Affective Empathy. This instrument uses a series of questions and Likert-scale rankings to measure how strongly respondents feel they understand the experiences of others and/or share in their emotional response. Researchers also conducted qualitative interviews with 32 students randomly selected from the group. Zaleski says that many of the students interviewed spoke about the value of education and empathic modeling when developing their own sense of empathy. Like Thompson, students shared how class discussions on issues like generational violence and poverty helped them become less judgmental. Some highlighted the personal impact of caring professors. Despite these themes, second-year master of social work students scored roughly the same as their first-year peers when it came to both cognitive and affective empathy. "When I started this study, I was thinking that we were able to teach empathy," Zaleski says, but the results have "led [my colleagues and me] to more questions than it has reassured us about what we thought we knew." Another approach to understanding empathy lies in cognitive neuroscience, the study of neural pathways originating in the brain. Scientists have discovered what they consider to be the body's source of empathy—a class of brain cells called "mirror neurons" because they fire when observing someone having an experience or sensation (Gerdes & Segal, 2011; Kaplan & Iacoboni, 2006). Mirror neurons help the brain recognize and mimic the facial expressions, vocal cues, and movements of others as early as infancy. A baby may see his mother smiling into his crib, for example, leading him to smile back and establishing a piece of his neural circuitry. According an article in the Scientific World Journal, the processing and storing of early experiences shapes how individuals respond to emotional cues across their lifetime (Decety & Lamm, 2006). "People's ability to wire themselves efficiently is dependent on a nurturing, caring presence throughout childhood," says Zaleski, whose academic focus includes neurobiology. "It's not something your brain just builds, it seems. Empathy needs to be taught to you." Specific recommendations for modifying one's neural pathways may emerge as scientists learn more about the brain's plasticity in adolescence and adulthood. In the meantime, Gerdes and Segal say that students can better trigger their stored emotional response with a few key changes. For starters, students can practice observing clients more mindfully to tap into nonverbal cues like body language and voice inflections. Building in time for reflection can also help students strengthen their empathetic reaction once a client session has ended. As the literature on learning empathy continues to grow, some instructors take an indirect approach by focusing on empathy's building blocks. Bell points to the importance of teaching self-awareness to help clinicians separate their own views from those of their clients. To facilitate this process, she often uses experiential, play-based activities adapted from her previous work with child victims of sexual abuse and a course she taught on play therapy. In one activity, Bell asks each student to create two masks out of clay to share with their classmates. The first mask reveals how students see themselves; the second reflects how others perceive them. Creating and discussing the two masks helps students talk about differences between people's authentic and public selves, Bell says. It also challenges them to consider why they and their clients might choose to wear different masks based on their environment (Bell, Limberg, Jacobson, & Super, 2014). Some students begin the course skeptical of play-based activities, Bell says, but nearly all come to recognize the value of creative reflection for both children and adults. "When students engage [in play-based activities], it's like this return to a form of communication that feels freeing because they don't have to find the right words to express what they're feeling," she says. Suthakaran also views self-awareness as an important step to expanding what he describes as cultural empathy. His teaching style focuses heavily on implicit beliefs established in childhood and how those beliefs may conflict with more rational thinking. He gives the example of a white woman who cognitively knows that racism is wrong, yet feels the impulse to cross the street when she sees a group of black men approaching. Suthakaran says that analogies help students identify with groups of people with whom they don't share common experiences by providing a more relatable example. Perhaps more importantly, analogies help students relate to others' emotional response. "What is empathy all about? It's my ability to feel connected with you at that emotional level even though I've not had the same experiences because I've had other experiences that can trigger those same emotions," he says. "It's about knowing what it feels like to be powerless, helpless, minimized." Successful analogies engage students experientially and typically use a near-universal example. When broaching the topic of systemic disempowerment, Suthakaran often begins with the fictional story of "Alice," a female office worker who is groped by a male colleague. Not only does Alice's male manager fail to investigate her complaint, he encourages her to view the act as a compliment instead of an offense. He begins the analogy by writing "Alice" and "breast" on the board before asking students to replace "Alice" with the name of a female important to their lives. Once students process how they would feel if their mother or sister or girlfriend were involved, Suthakaran replaces those words with "Native Americans" and "cultural symbols." That substitution spurs a related discussion about cultural misappropriation and the disempowerment of racial minority groups (Suthakaran, 2011). Bell, Suthakaran, and Zaleski say that educators have a professional responsibility to integrate empathy into students' academic journey. One way to do so is by creating a "safe space" that encourages students to share their personal experiences privately and without judgment. A safe environment helps classmates understand where their peers are coming from when discussing a complex or nuanced topic. Professors can also strive to act as empathic mirrors. Bell keeps this approach in mind in both her personal and group interactions with students. She often peppers course lectures with stories from her own experiences in the mental health field to normalize some of the challenges students face early in their careers. Even the inevitable request for an extension can serve as an opportunity to model empathy, albeit a tricky one for professors also trying to instill professional values. Zaleski gives the example of a student who asked to postpone her exams following the death of her grandmother. The student said she felt more cared for by a professor who declined the request but asked how she was coping with her loss than by another teacher who curtly agreed. "Most of our students are still forming their identities, their sense of self, and who, what, and where they want to be in their lives," Zaleski says. "Although we're not their parents, we have that sort of parental or leadership role where students do look up to us." Instructors should also arm students with the skills they need to maintain empathy as they advance in their careers. These exact tools remain unclear, but a glimpse into compassion fatigue research may provide some insight. According to Figley (1995), helping professionals experience compassion fatigue when they take on the suffering of clients and lack proper support both at work and home. The same empathy that drives social workers to alleviate the suffering of others can lead them to disengage from their work altogether. Instead, Radey and Figley (2007) ask the field to promote compassion satisfaction, the sense of client fulfillment that can occur when social work practice is rooted in positivity and self-care. Instructors can play a role in building compassion satisfaction, they say, by encouraging students to understand their available resources. Professors can show students how to use course materials to guide them through early clinical experiences, for example, or encourage them to ask others for support. This support can come from a coworker, supervisor, or even a friend. Some students, however, may benefit from professional counseling—particularly if they have gone through a traumatic event of their own. "Experiencing loss or trauma can help some people be empathic, but you also have to have worked through those things to be an effective practitioner," Bell says. "If you're still wounded and treating other people, you're not going to be empathic because you're going to be treating yourself." Zaleski says her next study will include an assessment of participants' trauma histories to see how those experiences may impact empathy levels. She hopes to one day complete a longitudinal study to measure students' long-term changes in empathy across the course of their social work practice. In the meantime, students are thinking about their own professional longevity. Thompson, who views social work as his professional calling, says he already worries that his empathy may decline 10 or 20 years down the road. More guidance is needed, he says, to help students approach their careers for the long run. "I have to believe that most people in social work school want to go out there and save the world," Thompson says. "We need these deeper conversations to ensure that we can." Barker, R. L. (2003). The Social Work Dictionary. 5th ed. Washington, DC: NASW Press. Bell, H., Limberg, D., Jacobson, L., & Super, J. (2014). Enhancing self-awareness through creative experiential-learning play-based activities. Journal of Creativity in Mental Health, 9(3), 399-414. Decety, J., & Lamm, C. (2006). Human empathy through the lens of social neuroscience. Scientific World Journal, 6, 1146-1163. Figley, C. R. (1995). Compassion fatigue: Coping with secondary traumatic stress disorder in those who treat the traumatized. New York: Routledge. Gerdes, K. E., & Segal, E. A. (2011). 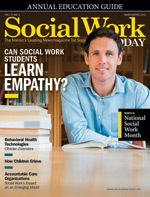 The importance of empathy for social work practice: Integrating new science. Social Work, 56(2), 141-148. Kaplan, J. T., & Iacoboni, M. (2006). Getting a grip on other minds: Mirror neurons, intention understanding, and cognitive empathy. Social Neuroscience, 1(3-4), 175-183. Radey, M., & Figley, C. R. (2007). The social psychology of compassion. Clinical Social Work Journal, 35(3), 207-214. Suthakaran, V. (2011). Using analogies to enhance self-awareness and cultural empathy: Implications for supervision. Journal of Multicultural Counseling and Development, 39(4), 206-217.